2.Click on the Add a File button. 3. Make sure My Computer is selected on the left hand side, then click Upload and search for your desired file on your computer. 4. Provide any needed comments for your instructor. NOTE: Recommended file types are .DOC and .DOCX. The file size limit is 20MB. 5. Review your submission information carefully, then click Submit. 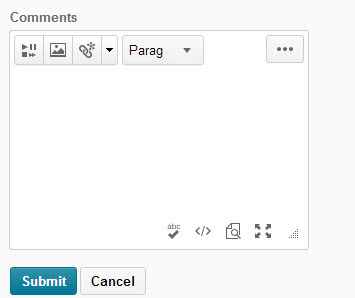 To see the report generated for your submission, return to the dropbox under the content module. 1. Click on the View chat bubble to view your Turnitin results. NOTE: Most originality reports are displayed in their respective Turnitin dropbox in 5 to 10 minutes. However, if the same paper is resubmitted, there is a mandatory 24 hour wait before the new originality report is displayed. Release and timing of originality reports is at the discretion of your instructor.